Ms. Julie Singer is the first teacher to arrive to school each day. She prepares the lesson, including writing the daily agenda on the board with the objective and the warm-up activity which links the lesson to real life situations, connections, and applications. She follows DACE course outlines when planning lesson plans and incorporates the College and Careers Readiness Standards (CCRS). She provides dynamic lessons by incorporating cooperative learning strategies and constantly monitors her students’ progress. She welcomes all her students with a smile and establishes an atmosphere of trust and courtesy so that students freely share their ideas and opinions. It is evident that Ms. Singer engages all her students in instructional research projects and class presentations aligned to instructional standards. She reflects at the end of each day by taking detailed notes on what lessons worked and did not work and adjusts her teaching techniques to address student needs for future lessons. 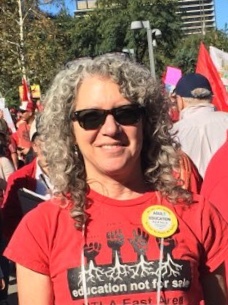 Ms. Singer also implements lessons and techniques that she has learned at conferences, professional development seminars, and webinars through CCAE, CALPRO, CATESOL, and DACE. Ms. Singer has been the student council teacher advisor at Eastside Learning Center since 2013. She is always willing to try a new activity with the council, including conducting various fundraising activities throughout the year for student scholarships. She has also assisted with organizing the student empowerment annual conference. Ms. Singer is an exemplary teacher and has always cared deeply for her students. She has an excellent rapport with her students and her enthusiasm demonstrates a joy for teaching that helps students perform to capacity. This is always evident by the comments students have given about her at the end of term ceremonies. She sees her students as individuals and takes the time to learn about their backgrounds and assist them to the best of her ability should they encounter personal issues. She always encourages her students to do their best and is patient and kind. She is compassionate toward her students and their struggles in and outside of the classroom.